Microsoft Office is finally coming to an iOS and Android operating system near you. Mobile phone and tablet users have patiently waited and hoped for Microsoft to release an app version of their pervasive software. There have been rumors and stories claiming Microsoft Office was coming to mobile/tablet devices for years, but the wait is finally over. According to a press release obtained by The Verge from the Microsoft’s Czech Republic representatives, the company is set to launch mobile versions of their Office software in March of 2013. In addition to Windows, Office will also be available on other operating systems, Windows Phone, Windows RT, Mac OS, Android, IOS and Symbian” says the Microsoft press release. The press release also mentions that Microsoft Office 2013 will be available for businesses as early as December of this year, and the app versions of the software will be made available to the general public at the end of February/early March of 2013. There was no mention of what the app would cost iOS and Android users. The most expensive apps in the Apple apps store can cost well into the $100s of dollar range. While it is probably too early to speculate on price, expect the Microsoft Office 2013 app to be a premium download that will cost well above the average price of a standard app. March Release Date: Coincidence or Perfect Marketing? One of the first things to stand out about the Czech press release is the March 2013 release date. March has traditionally been reserved for Apple’s launch of its new iPad. Over the last two years Apple has announced the specs for its new iPad in early march and sold the device a few weeks later. Knowing how savvy both Microsoft and Apple are with their marketing, it would not be a stretch to assume both companies strike a deal to incorporate the Microsoft Office app into the new versions of the iPad. While Microsoft Office may still be the gold standard for office productivity software many iOS users have found other apps to replace Office on their devices. There are a plethora of third-party productivity apps that fill in the gap that not having Microsoft Office leaves. Microsoft would be wise to use the release of a new iPad to promote its Office app in order to help it again a foothold on a productivity market that has found ways to replicate Microsoft Office on mobile phones and tablets. 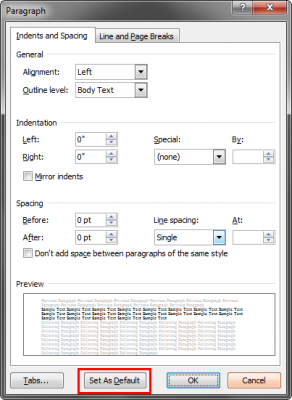 In a previous article, I wrote about how to change the default font and document settings in Word 2010. I recently ran into a frustrating problem on a computer where even though I was saving the settings as default like shown in the mentioned article, when I would close Word and then re-open, the old default setting still remained. Every new document that you create in Word is actually based off of a generic template referred to as the Normal template. Each time a new default font or other document setting is changed for all documents, you are really editing the Normal template in Word. I found that sometimes old or corrupt copies of the Normal template may remain and cause the problem of not saving new default settings for documents. After some searching, along with a little trial and error, I was able to resolve the problem as outlined below. Before starting, make sure that Word and any other Microsoft Office programs are closed. Step 1: Start by navigating to C:\Users\USERNAME\AppData\Roaming\Microsoft\Templates. You will see a couple of folders along with a file named Normal. Make a copy of any Normal or NormalOld files in-case something goes wrong. Step 2: Select and delete the Normal (and NormalOld files if they exist). Step 3: Open Word and you will see that the default font and document settings have returned to their default settings. In deleting the Normal template and opening Word, a new Normal template is created and saved to the Templates folder. 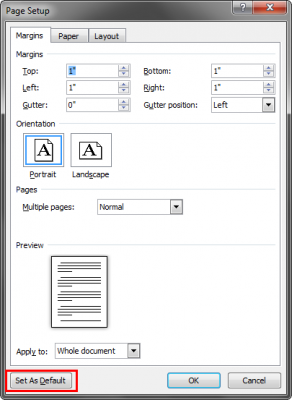 Step 4: Use our guide to changing the default font and other document settings. When you close and re-open Word your new default settings now save and are applied to any new documents. Have any other tips for using Microsoft Office? Share them with us by commenting below! The release of Microsoft Office 2007 brought some major changes to the popular office suite. Many did not care for these changes at first, but users soon started to enjoy the newest features of Word, Excel, and other Office 2007 programs. One feature in Office 2007 still seen in Office 2010 is a change in the default font from Times New Roman at Size 12 to Calibri at Size 11. 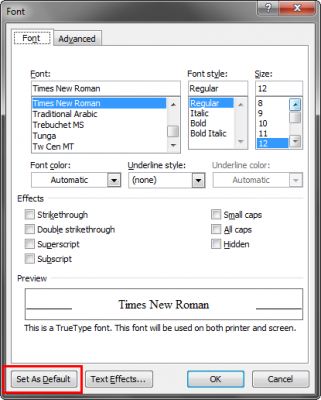 While the new font may be an improvement, many users have been frustrated if their documents must by typed in a particular font and they are constantly needing to change from the current default. In this guide I am going to show you how to set some of the default document settings in Microsoft Office Word 2007 and 2010. Step 2: Click the small arrow at the corner of the Font section of the Home ribbon to open the Font dialog box. You can also right-click the document and select Font… from the menu. Step 3: Set the font and font size you wish to have as the new default settings and click Set As Default in the bottom corner of the window. Step 4: Confirm that you wish to make the changes to All documents based on the Normal template and click OK. Step 5: Close and re-open Word and your new default font is set. 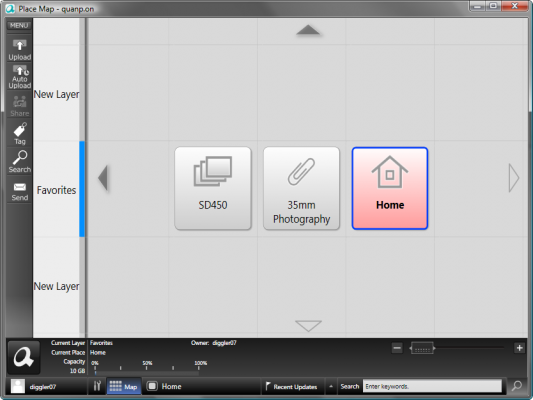 Step 2: Click the small arrow at the corner of the Paragraph section of the Home ribbon to open the Paragraph dialog box. You can also right-click the document and select Paragraph… from the menu. Step 3: Select the alignment, indentation, and line spacing you wish to have as the new default settings and click Set As Default at the bottom of the window. Step 5: Close and re-open Word and your new default alignment, indentation, and line spacing settings are set. Step 2: Select the Page Layout ribbon and click the small arrow at the corner of the Page Setup section to open the Page Setup dialog box. Step 3: Select the margin, orientation, and paper settings that you wish to have as the new default settings and click Set As Default at the bottom of the window. Step 4: Confirm that you wish to make the changes to all documents based on the NORMAL template by clicking Yes. Step 5: Close and re-open Word and your new default margins, orientation, and paper settings are set. It’s almost been a year since we covered the release of Microsoft Office 2010 Beta. In the time since the Microsoft Office 2010 Beta was released, over 9 million people have downloaded and installed the beta version. But since all good things must come to an end, the free Office 2010 beta will soon expire. Your Microsoft Office 2010 Beta is ending on October 31. The applications you’ve been using, including Word 2010, Excel 2010, Outlook 2010 and PowerPoint 2010, will become read-only viewers and the features you’ve been using will no longer work. Before this happens, we recommend you move up to the finished version of Office 2010. Since having a read-only version of Office doesn’t make for the highest productivity levels, now is the time to purchase the full version of Office 2010. As with previous versions of Office, Microsoft has a couple of different Office suites to select from. Be sure to choose the right one for your needs. Some changes available in Office 2010 include improvements to PowerPoint, Excel, and document co-authoring. Here’s a quick video on some of the new features available in Microsoft Office 2010. If you’re still not sure about purchasing a full version of Microsoft Office 2010, it is still possible to download and install a fully functional 60 day trial version of each Office 2010 suite. 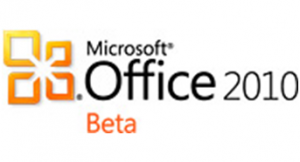 What has been your experience with the Office 2010 beta and do you plan on purchasing the full version? Let us know by commenting below! The world of online storage is a growing one, with different services and new features coming out all the time. Quanp, pronounced “Quan-Pah”, is one which I’ve found to be quite useful not only for its online storage, but the way in which it organizes and displays your files on your desktop. Quanp, short for Quantum Papers, couples its online storage features with an easy to use and visually appealing desktop software. This software enables you to store files in a folders called “Places”. After creating a Place, you can simply drag and drop files into it and view/sort them with 3D thumbnails. 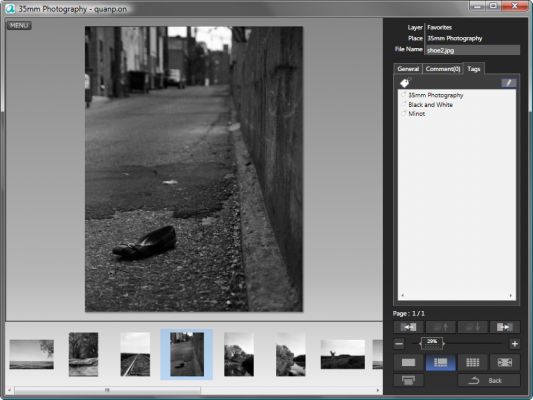 While loading your files into a Place you’re given the opportunity to add tags and descriptions to them. I found especially convenient that Quanp doesn’t require the physical files to be moved or copied when you load them into a Place. For example, I have a lot of pictures stored on my computer. When I load them from my camera, they are automatically sorted into folders by date. This is semi-useful if I can remember when I took whatever picture I happen to be looking for, but it doesn’t really do me any good if I want to search through only pictures of family, or landscapes. If I load all of my pictures into the Quanp desktop software, however, I can sort my pictures in a number of different ways while keeping my files and folders neat on my computer. What I find to be the easiest and most useful option is tagging. When I’m loading my pictures onto Quanp I can tag pictures/files based on what they contain. After they are tagged, I can use the included search options to search for pictures I’ve tagged as landscape, family, or landscape and family. The results are then brought up as thumbnails in 3D space which makes them easy to quickly browse through. If you find yourself searching for a specific tag or groups of tags often, it might be more convenient to make a different Place for those files. For example, I take all my pictures tagged Landscape and put them in a Place called Landscapes. 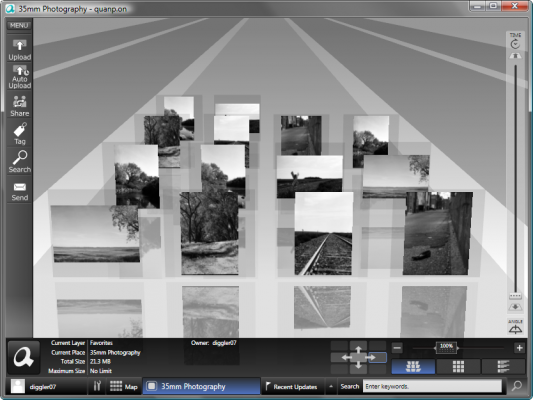 I can then simply click on the Place when I start Quanp to view all my landscape pictures. Even though a file my be stored in two or more Places in the Quanp software, the actual file remains unmoved from its original location. All of this so far has been only what happens on your computer. Along with all of the aforementioned awesome features, Quanp is an online storage solution as well (similar to previously covered Dropbox). Quanp will upload any files you load to the desktop software onto the service’s website. You can do this by manually pushing the upload button or you can set up and automatic uploader that will check for newly added files every so often (you can change the how often in the settings). Quanp has recently released an Add-in for Microsoft Office which can be downloaded at http://us.quanp.com/about/addin. I’ve never used an add in for before so I was a little wary about how it was going to work. Run the installation file and follow the install instructions. Once the add in is installed, it will appear on the right hand side of the Home Ribbon. In this article, I’m using Office 2007 on Windows Vista, so it’s location may be different depending on the Microsoft Office you use. Clicking the Quanp button will bring up a list of actions such as upload and download. Clicking download will prompt a log in box for Quanp. After entering your information, a box pops up asking you what Place your file is stored in. When you select the appropriate Place from the drop down menu, all the Office documents in the Place are displayed. 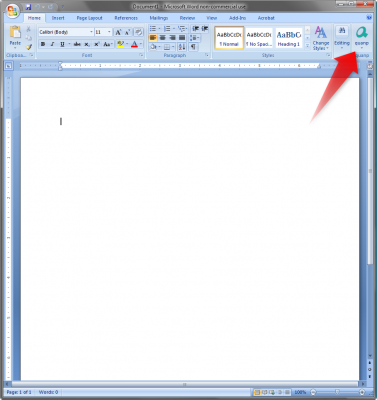 Double clicking a document will open it up in Microsoft Office. You can also save and upload documents from Office directly to your Quanp account. Quanp Send is a widget for Windows. It allows for quick sending of large file (500MB max) to other Quanp members and to email. To use it, simply drag a file and drop it on Quanp Send and a dialog box will pop up asking you who you want to send it to. 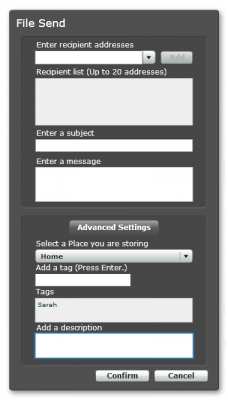 You can also assign tags and descriptions to the file before you send it off. All in all, I really like Quanp. I’ve always been a big fan of online storage services, and up until using Quanp, the problem has been that I had to move or copy the file I wanted from its original place on my computer to a dedicated shared folder. I enjoy using Quanp’s desktop software for its easy-to-use search options and quick browsing. The only problem I had with Quanp was at first when I loaded files with the software, I couldn’t get them to show up. Here’s the fix: there is a refresh button on the left side you may have to push to get recently files to appear on the software. Procrastinating at work. We’ve all done it at some point during the five day work week. Whether it be surfing the blogs, catching up on favorite shows, or playing the unprecedented amount of free online games out there, we have all found different ways to break from the insanity called the eight hour workday. 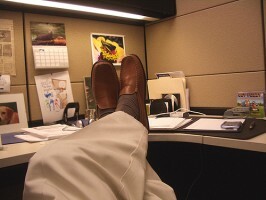 Subsequently, it is a known fact that when we do take a break from working, there is a good chance that our boss or IT department will stop on by and (in my case, 9 times out of 10) catch us in the act of inactivity. Such is the battle of the workplace. Since the boom of the internet, some IT departments have been at the forefront of this activity/inactivity war, blocking most websites and internet freedoms from their corporate populace. For some procrastinators and internet junkies, this restriction is called therapy. But for others, it is just a reason to adapt and evolve. Because I am a journalist first and foremost, I (for now) will not take sides on this “IT vs. Employee Internet Rights” clash. But what I can do is report on what the suppressed procrastinator has done to work around their woes. And here it is. Does this image look familiar? 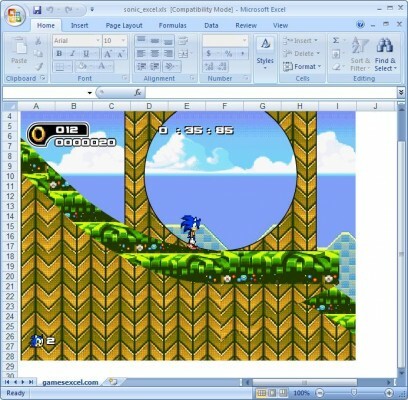 It appears to be Microsoft Excel, but yet there is a Sonic the Hegdehog game embedded inside of it. This is just one of the countless games available for download that use the standard Microsoft Office tools to get themselves running. The games are created inside the Microsoft Office programs, use any normal Microsoft file extension, and retain all the normal Office tools and features when opened or saved. Thanks to Flash plug-in functionality and the program Visual Basic for Applications (VBA), Excel and PowerPoint allow these games to exist inside of them and function with the help of a mouse and keyboard. Most PowerPoint or Excel games can be found by a quick Google search, but I have a few websites below to check out for starters. This site has a few traditional games (Battleship, Tetris, Chess, etc) for the Microsoft spreadsheet powerhouse, with some even formatted to not look like games at all. What I like best about this site is that it has a mission statement on why they support these games and their development. Another site for this genre, GamesExcel has both flash-based and VBA-based games available. They have some more popular games available and appear to update their lists daily; this is where I found the flash version of Sonic. They also have games like Monopoly, Super Mario, and Space Invaders available for download. Sister site to GamesExcel.com, GamesPowerPoint applies the same flash embedding opportunities to…well, Microsoft PowerPoint. With name brand titles like Castlevania, Metal Slug, and Megaman, how can one resist? These games, though, are basically in fullscreen presentation mode when they run, so I recommend exercising caution with these ones if they end up at the workplace. One final note on the subject: if one is interested in how PowerPoint allows some of the simpler games to be created, check out this article here on Dynamic PowerPoint and the interactivity features that allow if/then hyperlinks, action settings, triggers, and more. Game on. Microsoft Office 2010 is scheduled to release in June, but there’s no need to hold off from purchasing Office 2007 in the meantime. Microsoft recently announced free upgrades to Office 2010 if you purchase and activate an Office 2007 product between March 5, 2010 and September 30, 2010. 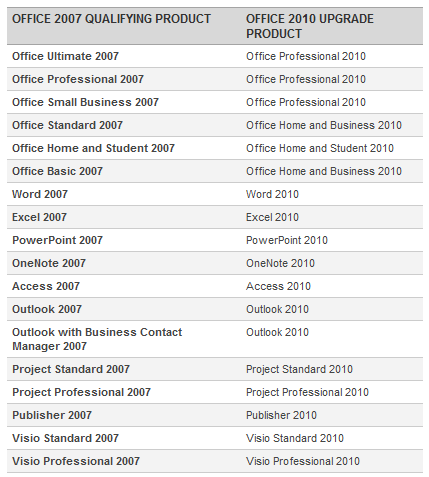 Several qualifying Office 2007 products are listed below, and you can check out the complete list at the end of this post. Microsoft Office 2010 is looking very good so far, and if you want to try it out before it officially releases you can download and install the free Office 2010 beta. 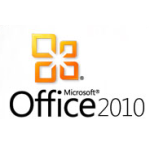 For more information check out the official Office 2010 upgrade page and FAQ. If you’ve ever written a document in Microsoft Office Word, chances are you’ve wanted to save it as a PDF for easy sharing. Publishing to PDF isn’t included in the standard installation of Microsoft Office Word, but you can add it in a few easy steps which I will cover in this quick tip. 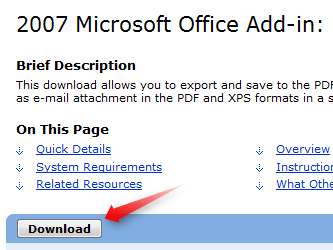 Step 1: Head over to the Microsoft Save as PDF or XPS Add-in for 2007 Microsoft Office programs page. Make sure to close Microsoft Office Word if you currently have it open. 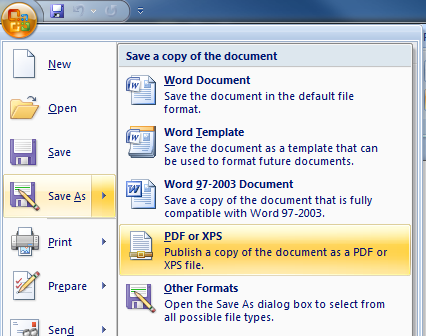 Step 2: Download and install the Microsoft Save as PDF or XPS add-in. Step 3: Re-open Microsoft Office Word. You will now have the option to save as PDF in the Save As menu! Microsoft Office 2010 has recently been released as as a public download. The download weighs in at a fairly light 685 MB and includes Word, PowerPoint, Outlook, Excel, OneNote, Access, Publisher, InfoPath, SharePoint Workspace, and Communicator (which is an instant messenger for Outlook). If you’re working in the IT field and want to prepare for the future, I would suggest downloading this software and testing out the new products (especially if you or your clients use them every day). My initial impression of Office 2010 is that the software is very promising. Although it looks similar to Office 2007, I can see that the program is much more customizable to an individual’s needs and wants. One new feature that I think most people will enjoy is a line preview for cutting and pasting. This lets you view what the paste would look like before actually performing the paste, which can save you a lot of undoing. 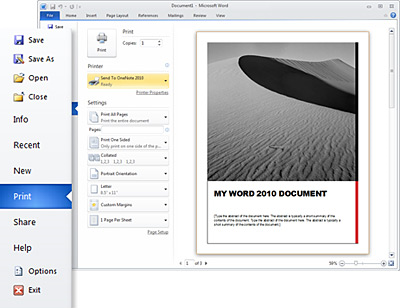 Word 2010 now comes with built-in photo editing tools which is great for users that have to edit pictures in their documents. PowerPoint has much better support for videos in presentations (which I wish was available when I was going to school). That’s my two cents on the new version of Microsoft Office, I’ll have more to come after I’ve used it some for longer than the time it took to write this article. Cheers!